I was really looking forward to visiting Island Pond, as I had not been for such a long time. It is renowned for its hard fighting Carp, but one of the great things about this lake is, even if the Carp are not in the feeding mood, there are huge bags of silver fish to be had out of every peg. As I was doing the draw I would take the final peg left in the bag. Fortunately for me it was a pretty good peg with plenty of features - "peg 6". It is a peg that I have drawn before in the past but not for a long long time. It offers and island situated about 30 yards away, just slightly offset to the right. There is also a large lilly bed situated just beyond the island. To my right in peg 7 is another large lilly bed. The rest of the peg offers plenty of open water. For today's match I decided to leave my pole in the bag and target the Carp good and proper, 2 Pellet Waggler Rods and 2 Bomb Rods were the order of the day and only if I was really struggling would I venture into my bag for the pole. 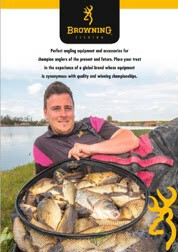 It really doesn't get any simpler, 8 mm and 11 mm fishery pellets..... Simple's! I started the session on the bomb casting slightly to the left of the island. The idea of casting slightly away from the island was that if I could get the fish feeding here, it would be less likely that when I hooked a fish it would try and run me round the back of the island and snag me or snap the line. Feeding wise I started by firing 2 x 11 mm pellets every 20 seconds on this line and for the line close to the lillies in peg 7 I started by feeding 5 x 8 mm pellets every minute or so. It wasn't long before the tip twitched, then steadily pulled round. On lifting the rod the fish made a bid for freedom but by keeping the rod low and applying plenty of pressure I soon managed to get the fish coming towards me, pretty soon the fish was safely in the net, a stocky Mirror Carp was the result. On the next cast I hardly got time to put the rod on the rest and I was in again. This was the start I was hoping for. the fish was soon safely netted. Before recasting again I catapulted a couple of batches of pellets onto each line. I noticed signs on both lines that the fish were up in the water, but I thought I would give them time to settle and stay on the bomb and it wasn't long before I was in again, another hard fighting Carp was soon netted. pellets I was feeding and try and cause more commotion, so when I cast out the pellet wag, they would be less particular. It worked a treat as the rod was nearly pulled from my hand a second after the pellet landed. This was much bigger than the previous 3 fish and on netting the fish it was a good 8 lb. It was at this point that the heavens decided to open and by heck did it come down. 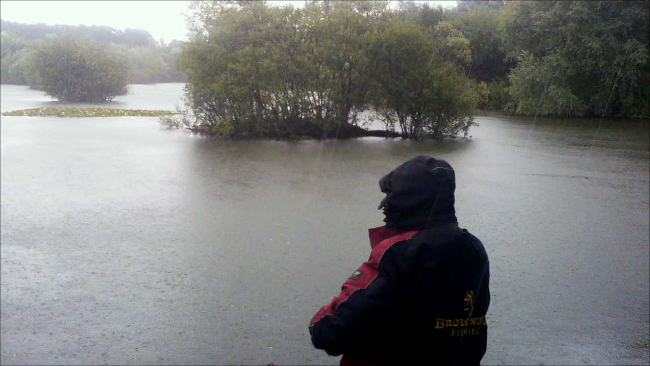 Thank goodness for Gortex clothing :-) Fortunately it didn't last too long, and it didn't affect the fish feeding. I decided to give the Island line a rest, so I changed to an 8 mm pellet as I like to fish on the hook what I am feeding . I flicked the waggler towards the lilly pads, the rod was again wrenched form my hands and the fish made a mad dash for the safety of the pads, this time the fish won and I came back hook length less. 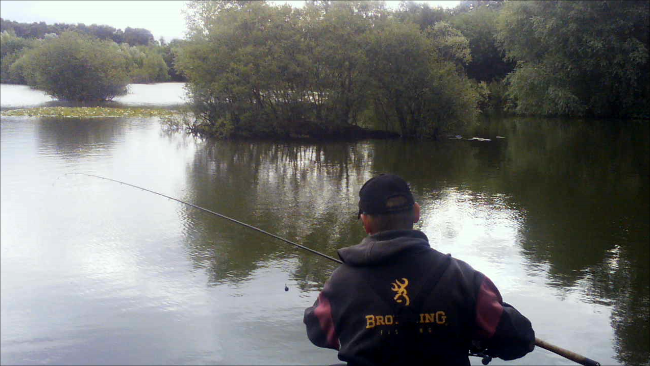 The remainder of the match was spent switching between the island line and the lilly line on the pellet waggler. 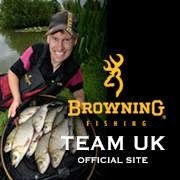 I will admit I got my backside kicked a good few times as some of the fish were massive and almost unstoppable. At the end of the match I had arm ache, which is always a good sign. I managed to weigh in 151 lb which was enough for second place. Mark Henderson managed to win the match with a touch over 180 lb caught mainly on the pellet wag.